Embedded in the nation’s increasingly favorable unemployment statistics — the country is currently in the midst of a record decline in the number of out-of-work Americans — is the persistent fact that black workers aren’t sharing equitably in this rampant job growth. In September, the most recent period when figures are available, approximately 134,000 jobs were created and the national unemployment rate dropped to 3.7 percent, according the Bureau of Labor Statistics. That’s fantastic news for the nation at large. But if you drill down into the bureau’s figures, you’ll find that black workers are not celebrating on par with their white colleagues. At 6 percent, the black unemployment rate is nearly twice that of white workers, at 3.3 percent. By way of comparison, Latino workers posted a 4.5 percent unemployment rate, and the Asian rate was nearly equal to whites’ at 3.5 percent. In a recently released state-by-state review of unemployment rates by race and ethnicity for the third quarter of 2018, Janelle Jones, an analyst at the nonpartisan Economic Policy Institute, found that 12 states have a black unemployment rate that is at least twice as large as the white unemployment rate. What’s more, in each of the 21 states and the District of Columbia, for which figures were available, the black unemployment rate was higher in each of them than it was for white Americans. Jones’ findings further underscore the fact that even as the nation climbs back from its pre-recession unemployment level, the bounty isn’t filling the pocketbooks of black Americans. For instance, she found the nation’s highest black unemployment rate was in the District of Columbia at 12.4 percent, producing a 6.2-to-1 disparity with white workers in the Nation’s Capitol. Worse, the District has the dubious distinction of having the highest black unemployment rate during the previous eight quarters — this despite the fact that Washington, DC and its surroundings are the third-richest metropolitan area in the country and home to the most affluent population on the East Coast. Other high unemployment states for black workers included Illinois (9.3 percent), Louisiana (8.5 percent), Alabama (7.1 percent, and New York (7 percent). The lowest unemployment rate for black Americans were Massachusetts and Virginia, both with (3.8 percent). Among Latino workers, the highest state unemployment rate is in Nebraska (5.9 percent), followed by Connecticut (5.7 percent), Arizona (5.6 percent), Pennsylvania (5.6 percent), and Washington (5.6 percent). In two states — Colorado and Georgia — the Hispanic unemployment rate was lower than the white unemployment rate. In Colorado, Latino workers’ 2.3 percent unemployment rate was lower than the 2.9 percent rate for white workers, and in Georgia, Latino unemployment rate was 2.8 percent, compared to 3 percent for white workers. As Fox described it the falling unemployment rate is, on the whole, a positive development for all Americans, especially black workers in their “prime working” ages between 25 and 54. At present, he said the gap between black and white workers in that realm is at an “all-time low” (noting that such figures can only be compared since 1994 when the federal government began reporting “prime working age” economic figures). But Andre Perry, a Brookings Institution Metropolitan Policy Program Fellow, cautioned against celebrating too soon. In a recent U.S. News & World Report interview he argued it’s way too early to cheer the economy’s recovery so long as a racial gap exists in employment. In other words, Perry says the celebratory narrative on the economy is almost exclusively the story of impressive gains for white workers and tolerance for black workers who continually lag behind. This article was originally published at ThinkProgress on November 2, 2018. Reprinted with permission. 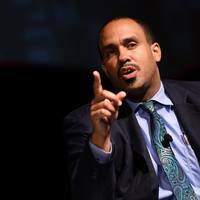 About the Author: Sam Fulwood is a columnist for ThinkProgress who analyzes the influence of national politics and domestic policies on communities of color across the United States. We applaud the Supreme Court’s decision to take up the DAPA and expanded DACA case, which will have profound consequences for our immigrant brothers and sisters who live and work every day under a cloud of fear, as well as for the state of racial and economic justice in our country. We are confident the court will reverse the decision of the 5th U.S. Circuit Court of Appeals and allow the Deferred Action for Parents of Americans and expanded Deferred Action for Childhood Arrivals policies to go into effect, affording millions of people the opportunity to apply for work authorization and temporary protection from deportation. We encourage the Department of Homeland Security to take all steps necessary to ensure these much-needed policies can be implemented as soon as possible after the court issues its decision this summer. At a time when working people feel increasingly disposable and deportable, when corporations are allowed to profit from the mass imprisonment of people of color, when our government is rounding up refugee families from their beds at night, and when we are confronting at so many levels the racial bias deeply entrenched in our laws and their enforcement, the outcome of this case will have a significant impact on the direction our nation takes moving forward. At heart, the question the Supreme Court will consider is whether our immigration enforcement regime will be allowed to take modest steps to begin to protect and empower hardworking people, or whether it will continue to serve as a tool to exclude and oppress. Much is at stake in this case, but working people do not need a court ruling to tell them what is just. In the face of criminalization, exploitation and base attempts to sow division, we will continue to work in every community in the country to build what we believe is the only true antidote: solidarity. This blog originally appeared in aflcio.org on January 19, 2016. Reprinted with permission. Richard Trumka is the president of AFL-CIO, the largest organization of labor unions in the country. He is an outspoken advocate for social and economic justice. Trumka heads the labor movement’s efforts to create an economy based broadly on shared prosperity and to hold government and employers accountable to working families.